This air pressure regulator and moisture filter attach to the airbrush hanger using the bracket included in this product bundle. The set-up clamps securely to a table or bench with the airbrush hanger's clamp. This set also includes a coiled vinyl cooling hose for connecting between your compressor and the regulator/filter. This condenses the moisture in the air as it cools in the hose before trapping moisture in the filter. The hose also allows your regulator to be situated on your bench away from your compressor under the bench, for example. 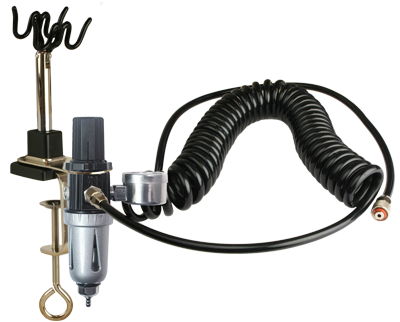 The hanger holds two airbrushes and is suitable for gravity-feed airbrushes and some other types of airbrush. 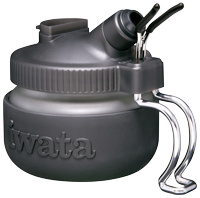 Note: If you require a hanger that will hold pistol-trigger airbrushes and all types of side-feed and bottle-feed airbrushes, please consider the Iwata Universal Airbrush Hanger, which also offers extra features such as heavier-duty clamp with extra depth for thick tables and connectivity to the Iwata Universal Spray Out Pot, or the complete Iwata Universal Workstation system including Iwata regulator/filter.